The Joe built me some beautiful shelves for Mother's Day. Here's a before shot of the wall. We'd been trying to figure out where to put shelves for quite a while. We didn't want to take away useable square footage from the main level, so we opted to build them high up on the wall. My 8yr. old is not a fan of reading, but she's a huge fan of climbing, so they've really peaked her interest in books. All of the kids are LOVING the new shelves...and so am I! I hope you all had a wonderful Mom's Day! That looks really nice! what a great idea! Thank you Vicky! The whole thing is constructed out of 3/4'' mdf. He made a face frame with 1.5'' strips of the mdf to give it a more finished look. Awesome! Thanks so much for the information! 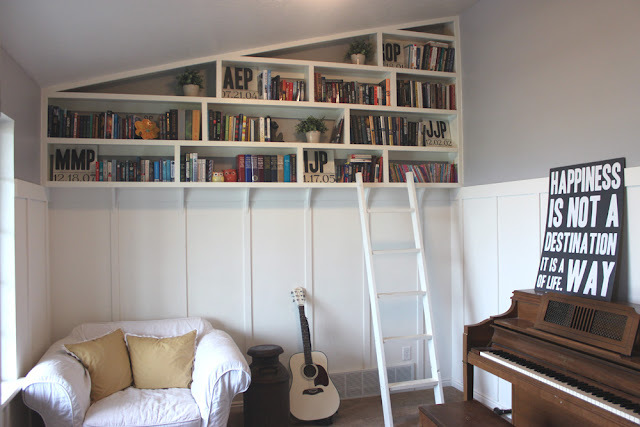 I absolutely love your room and the shelves just finished it off perfectly! Okay, I have to do this!! It's amazing. 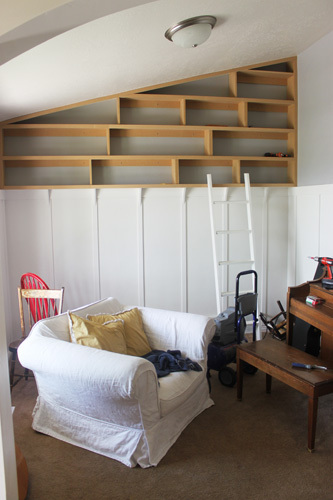 So did he just put the horizontal strips across (level), screw them into the studs, then place the shelves on top and add the vertical supports underneath? We are not handy but are thinking of trying this above our kitchen cabinets. The bottom shelf was already there. For that one we did just put the horizontal first. He built the rest in pieces. He'd make a top with two sides that had a 3'' support beam under the shelf part. He'd screw that to the wall and then build another section. This meant that there were a lot of places that had two boards butting up against each other, but he covered the entire thing with a face frame(just 1.5'' strips of mdf) so all of that is hidden. Does that make sense? I'm not sure if I'm explaining that very well. Let me know if you have any questions. How awesome are those! 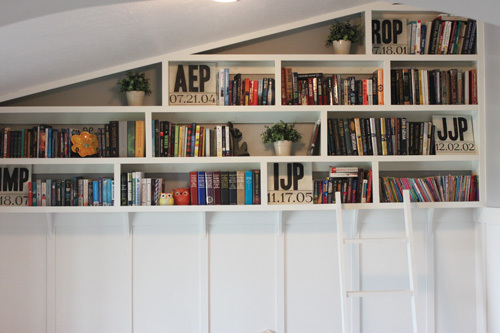 They look great and what a great way to use up that space. Wow sir! This is such a great article. Mind checking these?